Occupy Venice Film Series Meeting Tonight! - Yo! Venice! Home Venice Beach California Occupy Venice Film Series Meeting Tonight! Occupy Venice Film Series Meeting Tonight! 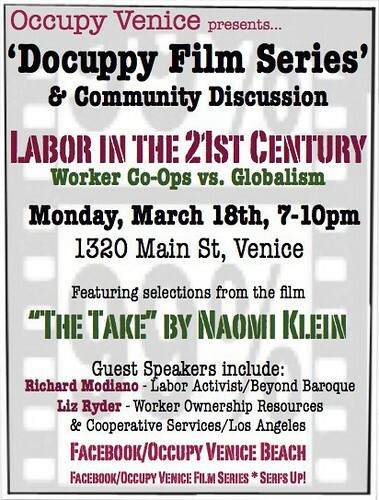 Occupy Venice will host their “Doccupy Film Series” and community discussion this evening starting at 7pm at 1320 Main. The event is free! Liz Ryder and Richard Mondiano will speak about the State of Labor in the 21st Century, Worker’s Co-Ops and the threat of Neoliberal Globalization/Corporatism. Sections of Naomi Klein’s documentary ‘The Take’ and ‘Shift Change’ will also be shown.